Today we’re looking at the Australian Cattle Dog Lab mix. Hybrid breeds are always a delight for the avid dog lover. The combinations of parents, variations of coat and color, and the overall variety of hybrid breeds ensure hours of curious discovery for anyone! However, it can be difficult to find exact and deep information on a particular mix. For the Australian Cattle Dog Lab mix, look no further. From the basics of height and weight to the details of little-known health possibilities, you can find a great overview of this mix right here today. Where Does the Australian Cattle Dog Lab Mix Come From? Documentation about hybrid breeds is sometimes simply not available. Sadly, the Australian Cattle Dog Lab mix is one such hybrid. We do know that the parent breeds have been around for a long time. The Labrador parent can trace a proud heritage back to the 1600s in Canada. Australian Cattle Dogs originate from a diverse mix of breeds and were standardized in the 1890s. Though not much is know about when the first cross came about, Australian Cattle Dog Lab mixes can boast of a proud heritage from both sides of the family. 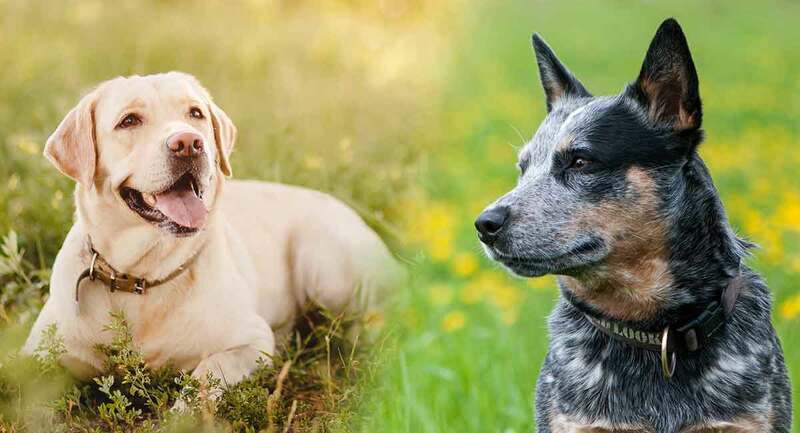 Ranging from the serious and sober working dog to the hyper and loving companion, the Australian Cattle Dog Lab mix is a wonderful example of a dog bred by and for mankind. Depending on the initial training and love that each individual puppy has received, these intelligent and loyal pups personify why humans love dogs. The combination of its parents’ traits can have startling results, making this dog always a delight to discover. This isn’t just reserved for interesting coat colors and eye combinations. One particular fact visually stands out: these dogs can have webbed feet! At first glance, the Australian Cattle Dog Lab mix can have any – or a mix – of seven different coat colors and three different eye variations. That’s a lot of variety, even in the same mix. Moving on to other readily visible characteristics, these dogs tend to be built on athletic and strong lines. Their chests extend to their elbows. Straight forelegs, level toplines, and strong backs all contribute to this silhouette. To round off this pleasing picture, an Australian Cattle Dog Lab mix will generally have a fine, rounded head, oval eyes, and happy expressions. They may take after one parent or the other as well, depending on the pup you welcome into your home. The density and length of these dogs’ coats is generally short, straight, and thick. You can generally expect these dogs to range from about 41 to 65 inches in height and weigh about 19 to 25 pounds. In addition, the parents could give their offspring pointy or floppy ears, a playful or solemn face, and a stronger appearance of one or the other parent. The overall temperament of this mix is smart and affectionate. The loving disposition of the Labrador parent and the instinctive drive to protect and herd of the Cattle Dog parent creates a powerhouse of energy. This can swing in multiple different ways. Something to keep in mind is that both parent breeds were and are working dogs. Australian Cattle Dog Lab mixes are going to be highly driven individuals with a strong need to serve and be useful. Due to the instinctive herding drive, these dogs tend to be more reserved and shy than other Lab mixes. They are also a little more stubborn and may tend to protect their charges above and beyond what is wanted! They are solidly loyal to their families and owners, including any children in the household, and they make great watch dogs. Because this mix tends towards the stubborn side, it is important that these dogs have gentle, loving, and firm training throughout their lives. A great place to start educating yourself is to check out our best dog training methods. It’s important to note that these dogs also need 45 to 60 minutes of activity throughout the day. If you need to leave your dog at home for extended periods of time (even a normal eight hour day) an Australian Cattle Dog Lab mix may not be the right dog for you. Be sure to potty train your pup. You might also want to check out our crate training guide, too. These pups aren’t generally prone to special exercise needs or other concerns that crop up in regular, healthy, daily life. Mixes as a rule are more healthy and diverse than purebreds. The Australian Cattle Dog Lab mix is no exception. What are some of the common health concerns of Australian Cattle Dog Lab mixes? How can you best care for them? While these lists may seem frightening, every mix and breed has a similar list. With proper care and attention, these issues can generally be avoided in a loving home. As with all dogs, quality food, healthy exercise, and regular vet visits are the best prevention. If warning signs come up, tests are available to figure out what exactly is going on. These include joint fluid samples, MRI scans, and more. Your veterinarian will know what is best for you and your dog. Another great place to start learning about any mix is by looking at the parent breeds. Labradors are known to suffer from patellar luxation, canine hip dysplasia, and canine elbow and shoulder dysplasia. On the other side of the family tree, Australian Cattle Dogs can be prone to progressive retinal atrophy, canine hip dysplasia, elbow dysplasia, and deafness. The Australian Cattle Dog Lab mixes reflect many of the same concerns. For more general information and education materials, a great place to start is at PetMD. As always, for particular problems, please contact your veterinarian. These dogs can be expected to live about 12 to 14 years of age. Moving on to more day-to-day care, they have no special care needs – though this can and will vary by dog. A thorough brushing every other day or so is best. Nails will need to be clipped about twice a month, and their ears should be wiped down every day. Put down a bowl of the best feed possible and provide plenty of water as always. Consult your vet for the best mixes for your canine family member. Do Australian Cattle Dog Lab Mixes Make Good Family Dogs? Australian Cattle Dog Lab mixes make great family dogs depending on the rest of the family! After all, a family of five with a small child is going to be very different than the power couple who runs every morning through the neighborhood. Because this mix is a working dog mix, these pups need some meaning in their day-to-day lives. If one is not given to them, they may take to herding/guarding young children and other pets to excess. On the flip side, they are very trainable and are devoted to their families. With proper care and attention, they are a wonderful playmate for children and guard for the home. A different family may be able to take their Australian Cattle Dog Lab mix on outdoor adventures on or a daily run together, providing exercise and refreshment for all. But for the family who is not very active and can’t give this mix a suitable goal and purpose, an Australian Cattle Dog Lab mix may not be a good choice at all. These dogs were bred to work, and that can’t be trained out of them. Again, it’s the perfect fit depending on your family, goals, and dreams for the newest member of your home. Only you can decide if an Australian Cattle Dog Lab mix is right for you. Rescuing your newest friend and family member is a wonderful thing to do. When you want a particular mix, however, where do you start? Finding Australian Cattle Dog Lab mixes that need a new family can be a frustrating task. The best place to start is by contacting various Australian Cattle Dog breeders and explaining the situation to them. These people are a great entry point into the Australian Cattle Dog world and have contacts that could help you out. You can also contact Lab groups and ask them for similar assistance. Keep in mind that Lab crosses are much more popular, so there may be more work involved with finding the mix that you want. Tracking down Australian Cattle Dog communities is a safer bet. How about finding an Australian Cattle Dog Lab mix puppy? First of all, it is extremely important to purchase a puppy from a reputable, health-focused, quality breeder. Puppy mills and other high-churn breeders are doing no good for man nor beast and should never be an option. Always make sure that you have access to paperwork such as the parent dogs’ pedigrees, health certifications, and the track record of the breeder in the past. This kind of information is invaluable when making the best decision possible. It is best to have this information before visiting a litter of pups, as it is easy to fall in love right away with them! Make sure that your decision is educated and informed for the best possible results. For more help, check out our guide to finding a puppy. What is the best way to train an Australian Cattle Dog Lab mix puppy? Regardless of the mix or breed, some things stay consistent. For a great overview of the subject, check out our extensive lineup of dog and puppy training tips, tricks, and articles. This will give you a good frame of reference for more individual issues. Something to always keep in mind is that these dogs are more stubborn than most. Gentle training and positive reinforcement are crucial at all stages of training. Remember that no matter what, a puppy is a puppy and will act as such. When bringing home your puppy, you will need plenty of supplies. We have some great information on products for Labs or Cattle Dogs, and since they are one of the parent breeds, many of the suggestions will work for your new Australian Cattle Dog Lab mix. Start with a harness, brush, and some food. For a quick refresher, what are some pros and cons of the Australian Cattle Dog Lab mix? Do you like the sound of an Australian Cattle Dog Lab mix but just don’t see it working out? Why don’t you check out these alternatives instead of ending a dream? The best way to rescue an Australian Cattle Dog Lab mix is to get into contact with the Australian Cattle Dog community. Please add your favorite rescue in the comments below! Because this is not a terribly common mix and it’s not well known, it can be difficult to find an Australian Cattle Dog Lab mix needing a forever home. Another option is to call around to local shelters and organizations and ask them to keep an eye out for you. Depending on your location and shelters, they may be your best resource of all time. Is an Australian Cattle Dog Lab Mix Right for Me? At the end of the day, it all depends on both you and the dog in question. If you are looking for a lively, loyal dog with goals and determination bred into the very fiber of its being, an Australian Cattle Dog Lab mix might be just right for you! Salladay, P. “Australian Cattle Dog Breed History,” Australian Cattle Dog Club of America, 2018. Mobley, H. “Is An Aussie Right for You?,” The Australian Shepherd Club of America, 2018.